Confronted with tragedy and pain, Barnum chooses to dream and to believe that there can be something better and in the film he does achieve great success. I really enjoyed the way that the plot asked questions about what this ‘world we’re gonna make’ was really all about? The film is a great exploration of whether success is about having the most money or the biggest crowds or whether is it about people and relationships? I was at a meeting recently when someone said ‘we’re all having to make do with less resources‘ and this got me thinking about our attitude to life. Barnum has nothing, he has no resources and yet he dreams of the possibilities and sets out to pursue them. Most of us have some resources and yet we can all too easily focus on what we don’t have rather than on what we do! Instead of dreaming dreams and imagining possibilities, we can end up looking down before we have even tried. How about us? Do we know what it is to dream of the possibilities or do we feel stuck and trapped? Children know what it is to dream and the dream that is the Kingdom of God is the biggest, and wildest dream of them all. The Kingdom of God is a place where there is no suffering, crying or pain and as we look at the world around us it feels unlikely if not impossible. As I learn to believe with the faith of a child though I can believe that the Kingdom of God is ‘the world God’s gonna make’. Is our faith really in God or is it in the Resources that we do or don’t have? 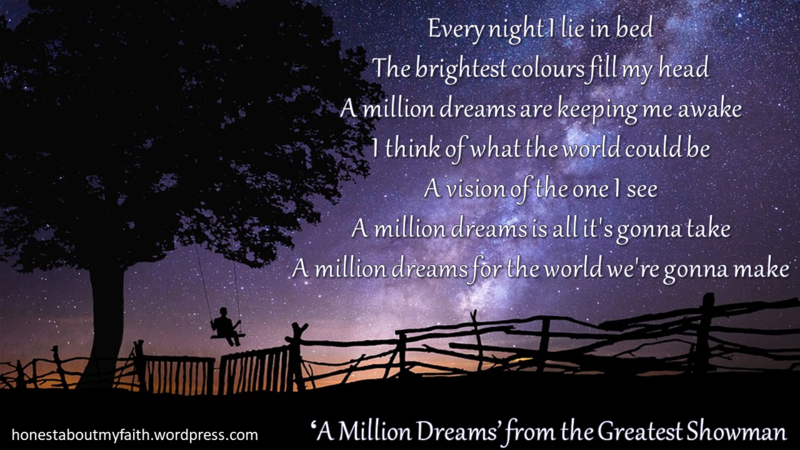 Do we lie awake at night seeing the dreams and possibilities that God has for us? Or do we lie awake at night worrying about what we don’t have? May God give us a childlike faith again that we might see what he is calling us to and that we might be inspired to step into it whether we have the resources or not! May God give us a vision of the Kingdom of God as we look to him in prayer. As we see the possibilities, may God give us the courage and the faith to work with him to help build his Kingdom. God, may your kingdom come and your will be done on earth as it is in heaven. We believe that your Kingdom is real and we look forward to sharing in it as we build it wth you. This entry was posted in creative communication, Faith, film, Kingdom of God, Life experiences, Life in all it's fullness and tagged contrast castle on a clous and I dreamed a dream, entering the kingdom of God like a child, film, God can do more than we ask or imagine, greatest showman, I dreamed a dream, kingdom of God, leap of faith, may your kingdom come may your will be done on earth as it is in heaven, million dreams, young Barnum and Charity. Bookmark the permalink.